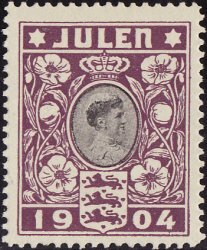 Denmark 1, 1904 Denmark TB Charity Seal, VF, ph. World's 1st TB Charity Seal, issued 1904 with image of Queen Louise. Denmark 1, 1904 Denmark TB Charity Seal, VF, ph. World's 1st TB Charity Seal, issued 1904 with image of Queen Louise. Danish National Society against Tuberculosis. Violet and Black; seal size: 24x30mm, previously hinged.